In July of 2015, I had the pleasure of painting for one of my favorite interior designers, Gina Lane-Olsson, in Colorado Springs. 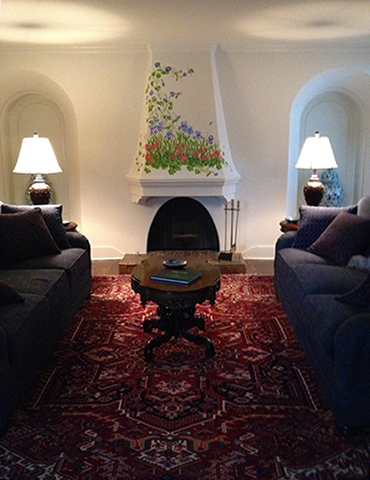 The owners of the home were delightful and I would be painting a mural full of flowers. To top it off, Little Bella was invited to join me! It just doesn’t get a whole lot better than that for me. This particular project turned out to be especially memorable because it was the last mural I painted before and since the accident. This home was actually the carriage house on a large estate. Gina did a fantastic job in keeping the aesthetics of the nearly one-hundred-year-old home. There were several beautiful paintings that had touches of vivid primary colors hung on off-white walls surrounding deep blue sofas and an extraordinary oriental rug to tie it all together. 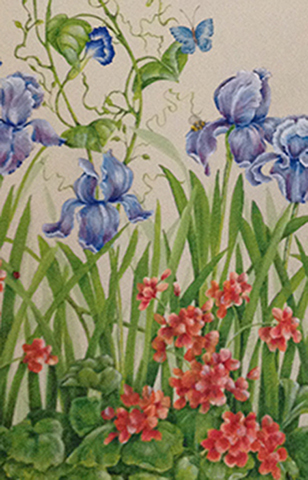 To keep harmony with the colors in the paintings and furnishings, I chose Iris’, geraniums and morning glories to enhance the fireplace. 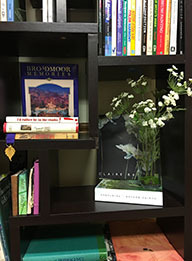 Several little surprises were added to give a truly personal touch. Included in D’Ann’s Garden is an array of lighthearted critters; a hummingbird symbolizing the enjoyment of life. The dragonfly carries the wisdom of adaptability in life, creating joy. Two ladybugs were added to represent the owners of the home. Three blue butterflies look as if they just took flight from the large vases standing regally in arched alcoves that flank the fireplace, they are representative of their three children. Throughout the garden of iris’ and geraniums twelve small ants scurry about representing the homeowner’s grandchildren who frequently grace this home. Of course, there is always a bee – to remind me to never give up. The story, as I remember, goes like this . . . In the early 1900s, it seems the city of Colorado Springs did not allow farm animals at the edge of town. The owners petitioned to change their minds to no avail. When the current owners read of their dilemma in the original deed they thought it all seemed a bit unfair so D’Ann decided to create quarters (of sorts) for the animals. 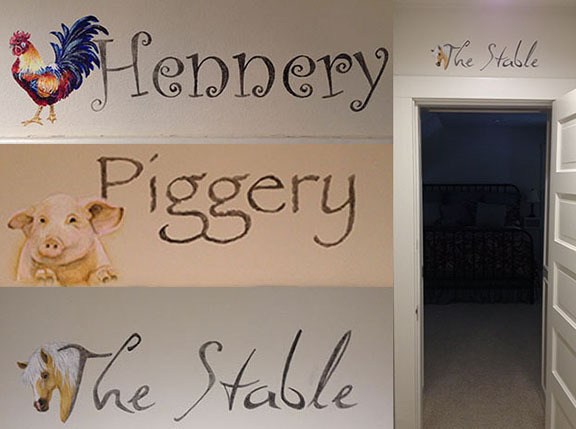 You can tell by the names of the rooms that someone has a creatively playful mind. Of course, each room is accessorized with the appropriate animals. The antique deed has been mounted and framed and is proudly displayed in the upstairs corridor. Well, look at this, someone is going to let me talk this time. Where do I start? Oh yes, please, if you don’t mind, be sure to address me as Miss Bella now. That is what y’al call we girls in the south. Halloween is a big deal in our neighborhood. Between 6-9 PM Halloween Night the city police barricade the streets. People drive miles from neighboring towns to Trick ‘r Treat here, even mommies and daddies dress-up. There is a decorated golf cart parade, too! This year mom had way too much fun getting some of the boys ready for Halloween! Did I mention mom has six grandsons! Yep, six, now that has been a source of merrymaking. One of my really good new friends is Tammy. She thought I’d be cute as a butterfly. What do you think? It was a night full of excitement and I liked the attention but I did get a wee bit tuckered-out. You haven’t lost your touch; you remind me of how wonderful it is to spend time with you. Bella looks like she was the “Bell-a-the-ball” on Halloween! Hi Cheri, it is always delightful of you to pop in, albeit virtually now. Just know I still appreciate you. Bella and I both miss you. She still likes cheese and crackers. That was a fun visit! Thank you for sharing your newsletter and all your beautiful work Mickey. Please change my email address I don’t want to miss any of these beauties. I also love seeing your artwork on your grandson’s faces. You are an amazing artist! I also love seeing Bella and listening to her commentary. I hope you are getting your health back and starting to feel like yourself again. Take care and I look forward to seeing your next newsletter. MH, thank you for taking time to comment. It is always a joy to have you pop in! Hope you and those beautiful grandkids are doing great!